Brenda M. Thulen joined Paradigm Precision in November, 2014, and leads the Human Resources area. In the role of VP of Human Resources, she is responsible for the human capital strategy, including diversity, training and development, employee satisfaction and engagement, performance management, policy and procedure, compensation, benefits, HRIS, staffing and recruiting and compliance. Mrs. Thulen brings with her over 20 years of experience in human resources. 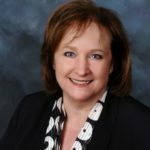 Prior to joining Paradigm Precision, she held a variety of human resources positions of increasing responsibility with various companies including Howmet, Dana Corporation, Goodrich Corporation, Barnes Group, Inc., Ensign-Bickford Aerospace & Defense, Dymax Corporation and, most recently, as Director of Human Resources with Veeder-Root, a Danaher Company. Ms. Thulen received a Master’s in Business Administration from the New York Institute of Technology and bachelor’s degrees in Psychology and English from Eastern Connecticut State University. She holds her SPHR certification from the HR Certification Institute.